I'm working on optimizing the variant filtering pipeline for my team. Currently we're using VQSR following the best practices guidelines. 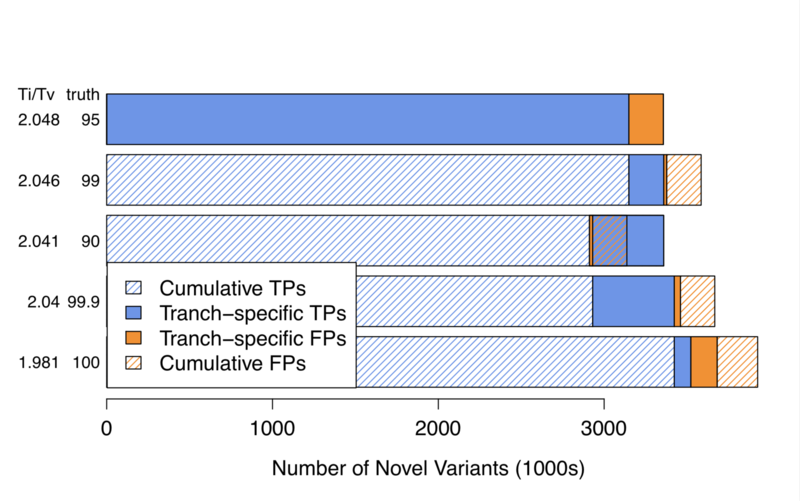 I've been testing VQSR's ability to discern FPs and TPs by applying VQSR to sequencing data we've generated from the GM12878 cell line and comparing those VCFs to GIABs gold standard na12878 call-set using VCFeval. While following best practices for VQSR lowers the total number of FPs, it also lowers the F measure score, meaning more TPs are being filtered than FPs. This isn't optimal, naturally. If I apply VariantRecalibrator with the GIAB snp call-set as a resource more FPs are filtered than TPs down to a tranche specificity of ~99.9. Ideally, I'd like to train a VQSR model using VCFs with gold standard call-sets as resources, output that model, and then apply that model to other VCFs. I've been working to test the possibility of using this approach to variant filtering. The first step is to feed VariantRecalibrator a GM12878 library and the GIAB truth set, output the model, apply the recalibration and get results from VCFeval. Next I want to input the model and the same VCF to VariantRecalibrator - ideally without resources, though that isn't possible - apply the recalibration and get results from VCFeval. If what I'm looking to do is possible, the two results should be the same for any given tranche. An example of VariantRecalibrator options I've tried are below. As I must supply some resources to VariantRecalibrator, I also tried minimizing the effect of any resources. Neither of these approaches have been very successful in producing results similar to the model when it was first generated and applied. Is there anyway to use an output model "as is" without having it changed by VariantRecalibrator the second time around? Or do I misunderstand the nature of VQSR and how models are trained and applied? Thanks a ton for any help! I really appreciate all the work y'all do! If I apply VariantRecalibrator with the GIAB snp call-set as a resource more FPs are filtered than TPs down to a tranche specificity of ~99.9. Can you post some tranche plots of different sensitivity levels? It would be nice if you show 90, 95 and 99.9. Ideally, I'd like to train a VQSR model using VCFs with gold standard call-sets as resources, output that model, and then apply that model to other VCFs. This is not ideal. VQSR uses the annotation values of the variants in your input callset to make the models, not the variant sites in your resource files. The models will differ from callset to callset, so it is not a good idea to have one model for every callset. Perhaps the presentation on VQSR will help here. Here's the image of the tranche plots using GIAB true positive sites to train the model. I understand that this is an adaptation of how VQSR is intended to be used. The idea is that training the model with known data can find relationships between annotation values that might be generalizable and could then be applied to other data sets in a way that might be more effective than applying VQSR using the best practices recommendations. I don't know if this will work necessarily, but I'm interested in testing it out. Is it possible to input a model and have VariantRecalibrator use strictly that model? Thank you for the help! I really appreciate it. Is the plot from using all resource files we recommend? Also, can you produce some tranche plots using different sensitivity levels and post them (setting --truth-sensitivity-filter-level to different values like 90, 95 and 99.9)?